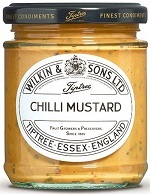 MUSTARD Powder (30%), Water, Wine Vinegar, Honey, Chillies(2%), Peppercorns, Salt, Acidity Regulator: Citric Acid. 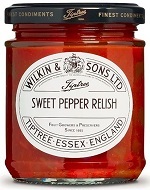 Peppers (45%), Sugar, Apples, Tomatoes, Wine Vinegar, Onions, Salt, Spices. 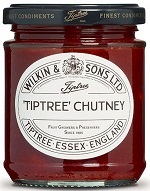 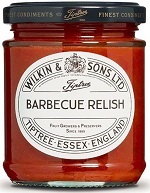 Made in Tiptree. 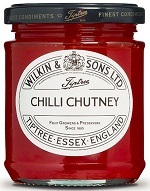 Sugar, Red Peppers, Wine Vinegar, Lemon Juice, Chillies (0.05%), Gelling Agent: Citrus Pectin, Acidity Regulator: Citric Acid. 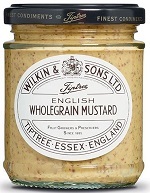 MUSTARD (38%), Water, Wine Vinegar, Honey, Salt, Spices. 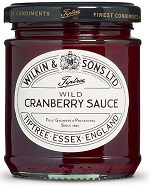 Cranberries(60%), Sugar, Gelling Agent: Citrus Pectin. 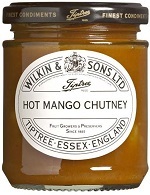 Mangoes (45%), Sugar, Vinegar, Salt, Chillies, Garlic, Ginger. 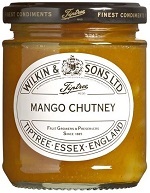 Mangoes (44%), Sugar, Vinegar, Salt, Ginger, Chillies, Garlic, Onion Powder. 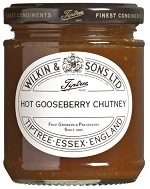 Sugar, Gooseberries (25%), Wine Vinegar, Red Currants, Spices (onion powder, chilli powder, ground ginger), Salt. 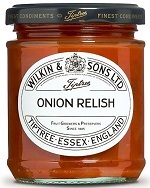 Onions (29%), Sugar, Tomatoes, Wine Vinegar, Oranges, Raisins, Salt, Gelling Agent: Citrus Pectin, Lemon Juice, Spices, Acidity Regulator: Citric Acid. 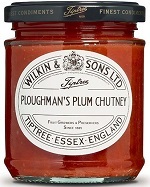 A classic British chutney, made from apples, raisins and plums.classic British chutney, made from apples, raisins and plums.